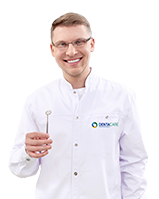 DentaCare / Advice / Scaling, sandblasting, fluoridation: the dental super trio! Scaling, sandblasting, fluoridation: the dental super trio! Many patients care about oral hygiene: they brush their teeth a few times a day, use dental floss and avoid excess sugar in their diets. However, in order to get the best results and be a happy owner of a beautiful smile, you also need to see a dentist. The dentist will perform a series of dental treatments: scaling, sandblasting and fluoridation. They will make your teeth healthy and white and your smile honest and wide! Scaling – what is it? Scaling is a procedure involving the removal of tartar deposits from the surface of teeth. The combination of saliva, food debris and consumed liquids causes plaque formation. If the plaque is not removed, mineralization may occur, which discolors teeth permanently and transforms plaque into tartar (calculus). This process is accelerated by a wrong diet (rich in sugars), leaving food particles behind when cleaning the teeth and some bacteria found in the mouth. Tartar can only be removed at a dentist’s office. It is a painless procedure. We recommend performing it 1-2 times a year. The presence of tartar causes inflammation, bleeding gums, lowered and exposed dental necks, and even contributes to the process of bone loss around the teeth, which can lead to periodontosis. 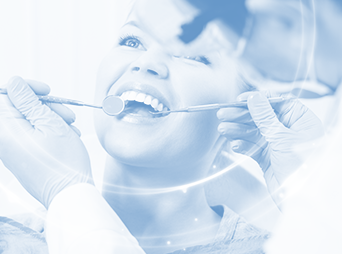 Dental deposits are removed with the use of both mechanical tools, such as ultrasonic scaler, and hand tools. Not only does tartar constitute a serious threat to oral health, it also blemishes your smile. Neglected teeth make you smile less and become less confident. Sandblasting – what is it about? Who does not enjoy a morning coffee and a glass of wine in the evening? Unfortunately, such small pleasures can cost us a lot. We all know that red wine effectively supports digestion, but it equally effectively contributes to ugly discolorations and our teeth going yellow. Luckily, there is a method that can wash away our little sins – sandblasting! It is a procedure that removes deposits and discoloration from the surface of teeth. During the treatment, a sandblaster sprays pressurized fine powder with some water inside the patient’s mouth. The mixture easily reaches even the most difficult places, such as interdental spaces. Sandblasting is painless. It can be performed after scaling or as a separate treatment. We particularly recommend sandblasting for smokers, individuals wearing orthodontic appliances and people whose diets include highly coloring products. The procedure may be inadvisable in patients with kidney diseases, asthma, chronic respiratory diseases and allergies to chemicals contained in the sand. In such cases, you should always consult your dentist before the treatment is performed. Fluoride is an element that has a strengthening effect on enamel and protects teeth against decay. The fluoridation procedure consists in applying fluoride to cleansed teeth. The fluoride is usually applied in the form of foam, gel or varnish. The procedure is usually performed as the last stage of teeth cleaning by a dentist or in the prevention of caries in patients prone to cavities or those with tooth hypersensitivity. Proper oral hygiene and preventive dental treatments give spectacular results! Our smile becomes our pride and asset. White and healthy teeth make us attractive and radiant. Spring is coming and we are more likely to wear bright clothes that emphasize the color of the teeth. It is worth taking care of them now so that we can impress others with our fresh and changed look in just a few weeks’ time.